Well, that didn’t take long. Only a couple months after acquiring the Reate Crossroads, another Reate has found it’s way into the collection. This time Reate has teamed up with knife designer Tashi Bharucha with a 4 knife series. I’ve long been a fan of Tashi. His designs are super clean, yet they all have a dynamic look to them. I’m an admirer, but mostly at a distance as his stuff is usually released in expensive limited edition runs. I haven’t been able to summon the ~$400 from my bank account to acquire one of his designs. This T2500 is interesting because it’s a sub $200 knife. That’s unique for both Tashi and Reate. So I had to snag one. As you can see, the T2500 compares favorably with the DF2. This makes a nice small EDC knife. It could also be called a Gentleman’s folder, although it has a bit of a “tactical” vibe to it. The blade is an elegant drop point. It’s mostly belly, terminating in a fine tip. This is the kind of simple blade shape that will take care of any small task. The blade has been given a high flat grind, and has been left with a satin finish and stonewashed flats. There is a small swedge and a harpoon tip. A tiny sharpening choil allows you to sharpen the edge all the way to the heel. The blade stock is a hair over 3.3mm thick, so this is a relatively thick blade especially given the size of this knife. All the details have been considered. There are no sharp edges save the cutting edge. All the others have been gently chamferred for comfort. Blade steel is tried and true M390. Reate always uses a premium steel and this knife is no exception. M390 has the covetable qualities of excellent edge retention, relatively easy sharpening, good rust and corrosion resistance, good toughness. It’s one of the best all round EDC knife steels. I have to confess that initially I was a little reluctant to put this knife through its paces. It’s a beautiful piece, and the small size and exceptional fit and finish gives the knife something of a jewel like quality. But I quickly got over myself and went to work. Boxes were broken down, food was prepared, packages containing yet more knives were opened. I didn’t take this one salt water fishing (I’ll leave that for the $22 Cold Steel Pro Lite Sport), but I basically did everything else with it. The T2500 is a phenomenal slicer. It came screaming sharp out of the box. The fully flat ground blade easily worked its way into boxes, got underneath the folds of envelopes, and could do a little food prep. The short blade doesn’t make it the most effective apple slicer, but you can get the job done with it. I didn’t have any issues with rust or corrosion. When it was time to touch up the edge, I was able to do that easily on my Spyderco Golden Stone. This reminds me, I still need to review my Spyderco Golden Stone. No complaints with the blade or the blade steel. It’s hard to tell, but there is a seam running down the spine of the handle where the two pieces meet. I’m also impressed by how the show side doesn’t show any hardware except for the pivot. Oh, and the carbon fiber inlay. That is a work of art. Running my fingers across it you cannot feel where the titanium ends and the carbon fiber begins. It’s absolutely seamless and perfect. I don’t own any inlayed knives to compare it with, but this strikes me as a tough standard to beat. Reate offers this with regular woven carbon fiber or marbled carbon fiber. I chose marbled to match my Crossroads. That was a good choice. There are a number of other interesting details with the handle. One is the lanyard hole, which has been integrated in a way to not spoil the beautiful lines of the knife. Another detail is the blue titanium hardware. All the machining is top notch. The handle has been exceptionally well considered. It’s an impressive job and one you need to hold to truly appreciate. This is a small knife, so it’s not going to work in the hand like a larger folder. The Dragonfly 2 is the most impressive small handled knife I’ve reviewed, and the T2500 is serviceable, but it’s not a Dragonfly 2. If you just use the handle you can get a comfortable 3 finger grip. If you use the flipper tab as a finger choil, then I can get all 4 fingers onto the knife, but it’s a little tight for my larger hand. That’s a trade off you get with most small knives. I will say the T2500 does feel good in hand. No sharp corners or hot spots. You would think the angled pommel would be uncomfortable, but it hasn’t been an issue for me. It slides in between my fingers. There isn’t much in the way of texture on this knife, but I haven’t had issues with it slipping out of my hand either. Bead blasted titanium provides enough traction for my purposes. The T2500 comes with a machined titanium clip. That’s a nice detail on a sub $200 folder. I know some folks aren’t fans of sculpted clips, but I think some companies have dialed them in. Reate is one of those companies, as the clip offers good looks and excellent spring retention. It works great as a pocket clip, holding the knife firmly in place. I haven’t had the knife slip down in my pocket or fall out. At well under 2 ounces, this T2500 carries like a dream. It’s excellent and reminds me a lot of the way the Dragonfly 2 carries. You simply don’t feel it in the pocket. It disappears until you need it. I wear shorts and pants with triangular pockets (rather than the “U” shaped pockets found on blue jeans), and the knife stays high in my pocket. That keeps it out of the way and avoids contact with things like keys and my flash light. Visually, the knife is relatively discreet in the pocket. The pokey looking handle and titanium clip with blue hardware will draw the eye more than something like a small Spyderco wire clip, but that’s the trade off you get when you opt for a fancier pocket knife like this. This is a titanium framelock flipper. The action is dialed in thanks in part to ceramic bearings and a ceramic detent. The flipper tab is generous and easy to get at. The knife flips with the best of them. I’d rate the action at an 8 out of 1-10. This is a small knife, so it’s a little more fiddly then a full size folder, but it’s not bad and I haven’t had any issues flipping the blade open. For lockup we have a titanium framelock with a stainless steel insert. Lockup is early on my knife, with the tang of the blade engaging with approximately 40% of the lock bar. Lockup is secure with zero blade play in any direction. Disengaging the lock is easy thanks to cutouts both on the lockbar and the non-locking side of the knife. There is zero lock stick. It’s a perfectly executed framelock. Blade centering is perfect on my knife. No surprises there given the price point and how dialed in everything else is on this piece. If you are looking for a small high end titanium framelock flipper, then look no further. This knife delivers. It is beautifully made from the finest materials, and Tashi’s design is as striking as ever. The T2500 is loaded with detail and the execution of every aspect of the knife is superb. This is a beautiful little knife. The T2500 strikes me as a high end and slightly less practical version of the Dragonfly 2. It’s pretty much the same size and weight. It carries similarly. It’s not as utilitarian as the Dragonfly 2, but it gets the job done. The ergonomics of the DF2 with it’s curved handle and forward finger choil remain unmatched by the T2500, but that’s OK.
That said, not everyone is looking for a micro knife. And although I knew this one would be small, but it’s very small. There are some sacrifices with a smaller knife like this. Mostly in the ergonomics. I would not be opposed to picking up the T3000, although I’m not sure they are even available at this point. Then again, I don’t have a lot of 2.5″ bladed knives in my collection. I expected the T2500 to be beautiful, but what surprised me was how much I ended up enjoying carrying and using it. It is lightweight and practical. I bought the T2500 as more of a collectible, but I will continue to carry and use the knife in my regular EDC rotation. So I suppose I could sum up this review by saying the T2500 is “surprising”. It’s both surprisingly small, and a surprisingly practical EDC knife. I recommend the T2500 for fans of small flippers, and those like me that wanted to try out a Tashi Bharucha design at a price point under $200. I recommend purchasing the Reate T2500 at BladeHQ or GPKnives. Please consider that buying anything through any of the links on this website (including Amazon) helps support BladeReviews.com, and keeps the site going. As always, any and all support is greatly appreciated. Thank you very much. Today we are taking a trip to value town. It has been a long time since I reviewed a sub $25.00 pocket knife, and as of the day of publication, the Cold Steel Pro Lite Sport is closer to $20 than $25. Ben reviewed the original Pro Lite back in 2016, and as usual he did a great job. But as an unabashed Cold Steel Fanboy, part of me wanted to sample this vintage for myself. So when Cold Steel introduced the “Sport” version of the knife with a thumb hole, I decided to buy one for review. And I’m glad I bought one. For under $25 this may be the most solid utility folder I’ve ever owned. It’s another Andrew Demko design for Cold Steel, but it’s at a price point even non-knife people can appreciate. The Pro Lite Sport has an overall length of 8.00″, a 3.5″ blade, a weight of 3.2 ounces, and is made in Taiwan. As usual, Cold Steel has produced a larger knife, but the Pro Lite Sport feel smaller than some of their knives I’ve recently reviewed. I think it’s a great size for those who can carry a larger utility knife. Personally, my day job is serving as a small town lawyer, so I’ve used mine as a “nights and weekends” carry. It has worked well in that regard. I’ve taken the knife fishing a number of times, and it’s worked well as a fishing knife. It’s robust and inexpensive, so I don’t mind exposing it to salt water, cut bait, etc. It’s a nice choice for dirty jobs. The Pro Lite Sport has a primitive looking drop point blade. The oval thumb hole and prominant “beak” to the blade reminds me of the profile of a prehistoric animal. The unique profile has been given a partial hollow grind, swedge, and stonewashed finish. The edge bevels on my knife are almost completely even, and the edge terminates in a stout tip. The only sign that this is a budget blade is some light machining marks on the spine and inside the thumb oval. The steel chosen for the blade is Krup 4116. This is a stainless steel that I don’t have a ton of experience with. ZKnives offers his chemical composition and a nice description of the steel. Krup 4116 is a carbon steel manufactured by German company thyssenkrupp, and is the same steel found in many Henckels and Wustof knives. I own a Wustof paring knife that I use daily, so maybe I have more experience with this steel then I realize. In my experience Krup 4116 is one of those easy to sharpen steels that won’t hold an edge forever, but is forgiving and easy to maintain. Sort of like 440C or AUS-8, but according to Z-Knives this is a little closer to 420HC. Whatever it is, Cold Steel has done a good job with the heat treat. It came shaving sharp out of the box, and I’ve put it to work breaking down boxes, opening mail, slicing fruit, and taken it fishing a few times. I’ve gotten into espresso lately, which means I’ve ordered all sorts of crazy espresso making supplies, and have transformed a corner of our kitchen into a low grade food sciences laboratory. Lots of boxes in the mail, and I’ve been using the Pro-Lite to break them down. The edge slows down after a few boxes, but it only takes a few swipes on my Golden Stone to bring it back to sharp. This is the kind of steel that is so easy to sharpen you can feel it get sharper on the stone. As usual for Cold Steel, it’s a superb knife to cut with. Handles well and cuts great. No rust or corrosion either. No complaints. The handles of the Pro Lite Sport are made of linerless high density plastic. This is a lock back knife, but there is a small integral plastic backspacer on the last third of the handle. Construction is screw together. Fit and finish is excellent. All the parts line up and there are no sharp edges to the handle. The result is a lightweight and durable handle. An obvious comparison would be with the Ka-Bar Dozier Folding Hunter, but there is no comparison. Compared with the Pro Lite, the Dozier Folding Hunter feels like a light duty toy that could break in half at any moment. Don’t get me wrong, the Folding Hunter is a fine light duty tool, but there is no comparison when it comes to the strength of these two knives. With the Pro Lite there is little flex when I try to squeeze the handles together. About as much flex as you would see on one of their linerless G-10 handled knives. The build quality is impressive. The ergonomics are excellent. This generous handle is simple and will accommodate a wide range of hand sizes. It takes to my paw like a duck to water. The handles are lightly textured, and there is a run of wide jimping along the back of the handle. This offers good traction and tactile feedback without being overly obnoxious. The handle is comfortable in forward and reverse grips. No complaints. The pocket clip is a stout stainless steel spring clip. The handles are drilled and tapped for ambidextrous tip up carry, and there are recesses in the handle for the pocket clip to slot into. The clip isn’t going anywhere, and it offers good spring retention. The Pro Lite Sport performs admirably in the pocket. The clip is pretty deep, burying 90% of the knife in your pocket. The knife is lightweight and the handle is relatively thin. It’s thicker than my Code 4, but much thinner than the chunky Voyager. At just over 3 ounces it carries wonderfully. The biggest difference between the original Pro Lite and this Pro Lite Sport is the use of a thumb hole instead of the thumb stud that appears on the original model. Cold Steel does a good job with their thumb studs, and Ben seemed to like the ones included on his Pro Lite, but there is a certain elegance and practicality to the thumb hole that is hard to ignore. The thumb hole is readily accessible, and it’s easy to open this knife with your thumb. The action is relatively fluid and smooth. The washers are made of teflon. I prefer phosphor bronze washers, as they are smoother and more durable, but for a sub $25 knife you are going to get some compromises. This is one of those compromises. Personally I think the action is good enough for government work, although in a perfect world we would have phosphor bronze washers here. For lockup we of course have a Tri-Ad lock. That almost goes without saying as the lock appears on almost all of Cold Steel’s folding knives. And once again that Tri-Ad lock performs admirably. For the uninitiated, the Tri-Ad lock is an improved back lock. It’s a proven lock design, and is arguably the toughest lock on the market today. Even though this is a plastic handled knife, I cannot muscle out any blade play. It’s rock solid. As usual, the lock bar is strong. So if you aren’t used to Tri-Ad lock knives you are going to want to include a grip strength tool with your order to bulk up the muscles in your hand. But for those familiar with this style of lock it offers a level of security that only a Tri-Ad lock can bring. Granted, I’m not doing anything crazy with any of my folding knives, but I wouldn’t hesitate to use this knife for any difficult task. While something like the Dozier Folding Hunter is a decidedly “light duty” blade, this Pro Lite will handle chores like hard carving, and crunch cutting thick rope without protest. On that note, I wish I had my Dozier Folding Hunter handy for a size comparison, but couldn’t find it for this review. Blade centering is perfect on my knife. Lovely to see on a sub $25 folder. I think the Pro Lite Sport is my favorite sub $25 folder. It’s a rock solid performer and it packs a ton of value. I think Cold Steel allocated their limited budget appropriately. The design is great, and they selected appropriate materials. I would prefer to see the teflon washers replaced with phosphor bronze. It may raise the price slightly, but I think it would be worthwhile. Beyond that, I find it hard to complain about this knife. If you are looking for a lightweight, tough, and inexpensive knife, then look no further. I haven’t reviewed a knife that has provided this much bang for your buck in a while. My favorite sub $40 folder is the ESEE Zancudo, and that continues to be an excellent knife. It is a better choice for urban EDC thanks to it’s smaller profile. It’s also ~$10 more. But if you want a no-nonsense work knife, then the Pro Lite Sport gets the nod. If offers an amazing bang for your buck. At this price they make nice gifts, and are cheap enough to keep as a dedicated tackle box knife, or a truck knife, etc. I think the Pro Lite Sport is a great inexpensive folding knife and I highly recommend it. I recommend purchasing the Cold Steel Pro Lite Sport at Amazon or BladeHQ. Please consider that by purchasing things through any of the links on this website you support BladeReviews.com, and help produce future reviews. Thank you very much. Reviewing the Zero Tolerance 0470 is about as safe as it gets. We have reviewed countless Sinkevich / Zero Tolerance designs. It is well within our comfort zone of review material. So why review the 0470? Well, it’s a beautiful knife, it appears to be built differently than the other ZT/Sinkevich collabs I’ve reviewed, and I bought the knife at a fantastic price. I hope no one minds. The 0470 has an overall length of 7.8″, a 3.4″ blade, weighs 3.3 ounces, and is made in the USA. Like the recently reviewed 0609 this model is aimed towards the EDC enthusiast. This 0470 is thinner, lighter, and more discreet than the ZTs that got the ball rolling for the company. I still remember the halcyon days of the 0560 and the 0300. Those models put Zero Tolerance on the map, but those were some big knives. Totally impractical for most people, but they paved the way for blades like this 0470. Personally, I’m glad ZT is continuing to head in this direction. I’m sure they will still release some big knives as well. Lets talk about the blade. It shares the same low slung lines that make a Sinkevich a Sinkevich. It’s a beautiful triangle of steel with a high flat grind, partial swedge, and two-tone satin and stonewashed finish. A detail I love on the blade of this knife is how the spine has been subtly chamferred up by the jimping. This is a feature on my Shirogorov F3 and on the Sebenza. To see this detail brought to a ~$250 knife is awesome. That chamferring has also been brought to the flipper tab. It eliminates any sharp edges on the flipper that can cut your finger. Another small touch is the generous sharpening choil. Frankly, a sharpening choil something I would expect to see, but it doesn’t always make it into every pocket knife. A blade shape like this can do no wrong, unless perhaps you are wanting to skin a buck with it. In that case the tip is probably a little too prominent, but for everything else this is a versatile and functional blade shape. For blade steel ZT went with CPM-20CV. CPM-20CV is made by Crucible Industries in Solvay, New York. CPM-20CV is chemically similar to M390, a high end European steel I have long appreciated. Crucible has a long track record of making high end specialty knife steel. Their catalog includes 154CM, S30V, S35VN, and S90V. They are specialty steel makers and know what they are doing. CPM-20CV and M390 have both earned a reputation for high hardness and excellent edge retention, while not being as stubborn to sharpen as something like S90V or ZDP-189. CPM-20CV is also stainless and tough. It’s arguably the best all-round blade steel money can buy as of early 2019. In practice, the blade of my 0470 has been a excellent performer. The blade came razor sharp. The edge bevel was neat and even, and the stock blade easily popped hairs off my arm. After sanitizing the blade thoroughly (ie, wiping it on my shorts), I put the knife into my daily carry rotation. I used it at home and at work for opening mail, breaking down boxes, and food preparation. I used the 0470 in place of my paring knife for vegetables and fruit. The blade has performed admirably. It tracks through cardboard and holds up well under harder use, but the geometry is nimble enough to slice apples cleanly, route the tops off of strawberries, and mince garlic. Edge retention has been excellent. When the edge begins to slow I show it to my near mythical Spyderco Goldenstone, and all becomes right in the world again. No issues with the edge chipping or rolling, and no signs of rust, staining, or corrosion either. The handle is where things get interesting. If you peruse our pretty decent catalog of ZT reviews, you will notice there is nothing quite like this 0470 with it’s 3-d machined titanium handles and marble carbon fiber inlay. It’s a level of complexity and workmanship I haven’t seen on any of their other production knives. That’s what drew me to this knife. If the handle didn’t have this unique twist I probably would have passed on it. The end result is an simple and classy handle. It’s elegant, not ornate. And it has been done beautifully. There is not a stray mark on this knife. And I love the simplicity of the handle construction. There is only one body screw at the tail end. Inside the titanium handle pieces have been deeply milled out to reduce the weight. Holding it all together is a black aluminum backspacer with an integrated lanyard hole. Again, this integrated lanyard hole is a feature found on my significantly more expensive Shirogorov. Since I’m not a big lanyard guy I really appreciate how they avoided drilling a big ugly hole into the handle of the knife. It’s a level of care you simply don’t see on most pocket knives. This detailed disassembly video shows the tight tolerances and attention to detail of this knife. Impressive. I don’t think I’ll be taking my knife apart any time soon. The ergonomics of the 0470 are excellent. It’s a simple open design that will accommodate most hand sizes, and the spine of the canted handle meets my palm easily. The balance point is just behind the pivot, making the knife feel light and natural in hand. Texture has been used strategically on the 0470. A run of fine jimping on the spine of the blade is balanced by coarser jimping on the back of the handle. The handle pieces aren’t heavily textured, but they are deeply contoured to meet your fingers and given an attractive end mill finish. The net result is a positive grip and a knife that isn’t going anywhere. It’s comfortable to hold in forward and reverse grips. The pocket clip is a simple metal spring clip. No 3-d machining on this model. I’m OK with that. The clip design is simple and effective. It was designed for this knife and follows the lines of the handle. It also lacks any overt branding. It offers good spring retention and is easy to insert and remove from your pocket. The handle is drilled and tapped for ambidextrous tip up carry. It’s not a deep carry clip, but most of the handle is buried. In practice the 0470 carries well. With a near 3.5″ blade, the 0470 is still on the larger side of a true EDC knife for me. It is substantially bigger than the Dragonfly 2, the most pocketable folding knife of all time. But I don’t think comparing the 0470 to a DF2 is fair. In defense of the 0470, it isn’t a huge knife, and it has a gentleman’s folder quality to it. It’s just a little over 3 ounces. For its size the knife carries well and the pocket clip does a good job keeping the knife in place. The 0470 is a titanium framelock flipper running on caged bearings. The flipper keeps a low profile and heavily jimped. The action is smooth and easy. After disengaging the lock the blade will fall shut with a flick of the wrist. However, the detent on this knife is surprisingly light. The blade doesn’t fall out of the handle, but it’s not the level of snappiness I’m used to. The best way to open this blade is using the light-switch technique. Push buttoning it gives me mixed results. The angle of the flipper tab seems to be designed for light switching. I find the light detent highly unusual given ZT’s long track record of dialed in detents. I would often comment in my reviews how they are the industry standard in my book. But here the 0470’s detent was surprisingly light, and I don’t think I’m alone either. The knife works fine and with the right technique there are no issues opening the knife, but those expecting the typical action of a ZT flipper will be disappointed. At least initially. Now that I know to lightswitch it I’m able to get the blade open every time, but still this came as a surprise. For lockup we have a titanium framelock with stainless steel lockbar insert. Thankfully there were no surprises with the lockup on this knife. Perfectly rock solid, with early engagement, and easy to disengage. No sticking, and absolutely no blade play. This is exactly what I would expect from a Zero Tolerance blade. Blade centering is also perfect on my knife. If you are like me, and think there is no room for another ZT in your collection, then the 0470 might just change your mind. It’s a different knife from this company. Just when I was beginning to lose interest in their offerings they tempted me with this dressed up EDC knife. I think this constant evolution of their products is what keeps the brand interesting and relevant. They continually step out of their comfort zone, and don’t mind pivoting in different directions. Another example of this is their 2019 0022. It’s the smallest knife they have made, and I just might have to grab one. But lets get back to the 0470 in particular. I love the classic Sinkevich lines paired with the heavily machined and highly engineered titanium handles. The carbon fiber inlay adds a touch of class. The blade cuts well, the handle is comfortable, the fit and finish is top notch. It’s everything you would expect executed near perfectly. The only surprise was the light detent. Frankly when I first got this knife I thought something was wrong with it. I was shocked. But now that I’ve had the chance to carry and use the knife for a few months, I have no issues getting the blade open. And my understanding is that this is typical on the 0470. If you own the knife please let me know how the flipper action is for you. At the end of the day I think the pros far outweigh any cons cons. At ~$250 this is not a cheap knife, but you can see where the money went. I have enjoyed mine and can easily recommend it if the design intrigues you. I recommend purchasing the Zero Tolerance 0470 at Amazon, or BladeHQ. Please consider that by purchasing things through any of the links on this website you support BladeReviews.com, and help produce future reviews. Thank you very much. Regular readers may recall I’m attempting to step outside of my comfort zone and review more automatic knives. I started with a couple high end Microtechs, swung down to the Boker AK-74, and have now changed course towards something resembling the middle ground: The Kershaw Launch 4. The Launch 4 is one knife in a series of Kershaw Launch automatics. The Launch series was released a few years ago. These are simple, USA made knives with clean lines, and aluminum handles that come in a number of colored anodization choices in addition to a more standard matte black offering. The knives in the series appear to hover in that $75-$125 price point. So it’s a premium offering, but won’t break the bank. I selected the Launch 4 due to it’s unique size and profile. It’s unlike anything else in my collection. Kershaw has plenty of Launch knives with 3-3.5″ blades, and I may check one of those out later on, but there was something about the diminutive Launch 4 that caught my eye. The Launch 4 has an overall length of 5.10″, a 1.9″ blade, weighs 1.98 ounces, and is made in the USA. The Launch 4 is a “Cali Legal” automatic with its sub 2″ blade. Cali Legals are an interesting class of automatic knives, that feature blades that are 2″ long or less. This is a category I wouldn’t mind exploring further. At any rate, this small knife, suitable for daily carry, assuming it’s legal for you to do so. As always, please check your local laws before purchasing an automatic knife. In many places these sorts of knives can be either illegal to own or carry. Be careful. The spear point blade is stout, and made from blade stock that is just over 3mm thick. Adding to the ruggedness is the partial hollow grind and partial swedge. The end result is a knife with a sharp yet meaty tip. Kershaw offers this knife with both a black DLC coated blade as well as uncoated versions. Blade steel on this knife is CPM154, a tried and true American blade steel I have grown to both know and love over the years. CPM-154 is easy to sharpen and holds a nice edge. It’s the powder metallurgy version of the classic. The powder metallurgy process results in a finer grained steel, and is an upgrade over standard 154-CM. I have noticed some of my 154CM blades will rust on me if I’m not careful, so I’m kind of glad I got the coated version here. At this price point I’m glad to see CPM-154 stamped on the blade. That’s not a steel I recall seeing Kershaw or ZT work with before. It’s a nice surprise and a great choice for this price point. In practice I have had the chance to use my Launch 4 as a daily carry utility knife. I bought this knife around Christmas, and like most households we received a lot of packages during that time period. The Launch 4 has gotten a lot of work with cardboard. It cuts cardboard capably. Not the absolute best slicer with its short stout blade, but it gets the job done. It’s not my choice of knife for cutting apples, or for food prep in general, as the blade is too short and the juices end up flowing into the pivot area, but then again this knife probably wasn’t designed for preparing apple slices. I’m pleased to say the DLC coating has held up really well. DLC is my favorite blade coating because it is so durable. Cardboard is highly abrasive and can mar up the look of a coated blade easily. Here, there are a couple micro scratches on the finish but that’s it. Also, I found the knife easy to sharpen on my Spyderco Golden Stone. The Launch 4 features beautifully machined aluminum handles that have been given a brilliant royal blue hard anodization. This is a two piece handle with an integrated backspacer. I am impressed with the handle of this knife. The design is extremely clean and thoughtful, the engineering is top notch, and I love the contrast with the black hardware and blue handles. The handles have an almost iridescent quality to them, shimmering in the light. However, the ultimate beauty lies in the simplicity of this knife. That same simplicity carries over to the ergonomics. The coffin shaped handle clocks in at 3.2″. There isn’t much to grab, but the knife still manages to fill the hand and disappears into your palm. You can comfortably hold the knife in both forward and reverse grips. The knife probably does best in a reverse ice-pick grip. In that way it feels very shank like. But you can also hold the knife normally and it will certainly open a letter. There is no jimping on this knife, or any aggressive texturing. However, the hard anodization has a light texture that provides some nice tactile feedback, and the Launch 4 doesn’t feel slippery. Still, those actively seeking out knives with “traction plans” may want to stock up on skateboard tape, or pick something else to shower with. The pocket clip dominates the back handle of this knife. It’s a standard Kershaw clip given a black parkerized finish. The handle is drilled and tapped for right side tip up carry only, but you can hardly fault Kershaw for that given the diminutive size of this knife. Really, that’s the only place where you can place a clip and not interfere with the deployment button. In practice this is a discreet knife. Kershaw has pushed the clip as far back to the pommel as they could without opting for a full on deep carry clip. I think the knife is small enough as it is, and I’m not sure having it completely buried in the pocket is a good idea. That said, if you get the all black version of this knife my guess is that it would be pretty stealthy. Especially if paired with some black leather pants for a black on black on black effect. Just sayin’. The Launch 4 is easy to carry. Sub 2 ounces and tiny, it’s a little thicker than a Dragonfly 2, but in practice I didn’t notice it much. This is a push button auto with a coil spring. It’s just like the Microtech Stitch and Boker AK-74 I have reviewed in the past. A tried and true design that should offer years of trouble free use. The action is stiff and snappy. Not quite Microtech levels, but pretty damn good. You need to pay attention or the knife could fly out of your hand whilst deploying the blade. I haven’t taken this one apart yet, but it appears to be a washerless design where the aluminum frames act as integral washers. That is similar to some of Hogue’s designs. There is no safety of any kind, but the button requires a good deal of travel to open the blade. Opening the knife accidentally is unlikely, but like any knife you need to treat this tool carefully and with respect. Lockup is secure and play free thanks to the stout button lock. The one nice thing about reviewing autos is that you do see a lot of button locks with this category. I’ve warmed up to good button lock knives over the years. They aren’t as in vogue as frame locks, but done right they are strong and practical. This Launch 4 is no exception. The Launch 4 is dialed in. The clean design, tight tolerances, and excellent choice of materials give the knife a premium feel. In an age where you can spend a lot of money on exotic materials and design flourishes, there is something refreshing about buying a knife that strikes that perfect balance of form and function. Kershaw didn’t go super cheap, and they didn’t gild the lily either. They managed to find that sweet spot and allocated their budget to good blade steel, tight tolerances, and durable finishes. The end result is a rock solid small format auto for well under $100. If you are looking for a premium Cali legal auto, then I think the Launch 4 is an excellent option. It’s reliable and durable. I can see why this is a popular choice. I recommend purchasing the Kershaw Launch 4 at BladeHQ. Please consider that buying anything through any of the links on this website (including Amazon) helps support BladeReviews.com, and keeps the site going. As always, any and all support is greatly appreciated. Thank you very much. The Emerson CQC line of folding tactical knives are downright legendary. Mr. Emerson’s knives were the first folding tactical knives and are common to see among the armed forces, with police, and of course average Joes like me. CQC stands for ‘close quarters combat,’ and these knives are designed to be used as weapons as well as useful EDC tools. This particular model is the Mini CQC-15. The Mini CQC-15 is a compact option that retains the legendary quality and reliability of Emerson’s knives. The CQC series is quite expansive these days, and the knives come in various sizes, colors, and configuration. The Mini CQC 15 is a hybrid of the two most popular knives in the CQC line, the Commander and the CQC-7. The Mini CQC-15 is smaller than the CQC 15, but it isn’t a small knife by any means. It’s an average size EDC knife with a 3.5-inch blade. The overall length with the blade deployed is 7.9 inches, and total weight is light 4 ounces. The blade is .125 inches thick and is made from 154 CM. The Mini CQC 15 sports the piercing tanto point of the famed CQC-7B and the recurve blade of the Commander. This odd combination does give you a versatile knife blade that stabs and slices easily. The belly isn’t as prominent as the Commander, but it’s still enough to make it a good choice for skinning deer. You also get that extra cutting edge in a shorter profile. The tanto blade is, of course, a great piercer. If used as a weapon in a military scenario it will make quick work of clothing, web gear, or uniform shirts. The blade is made from a durable and corrosion resistant 154 CM steel. Its Emerson’s steel of choice for these knives and is a good steel for these knives in particular. It’s tough, but not hard to sharpen. The blade is a chisel grind which has some strengths, but also weaknesses. It’s very strong, easy to sharpen and the edge lasts a good while. A chisel grind is a rough cutter and feels like it catches and jumps when you are trying to do precise cuts. In my time as a Marine, I carried an Emerson CQC-7BW. At that time I knew nothing about knives, but I knew the CQC-7BW was ‘the’ tactical knife. Over time I grew to appreciate 154CM steel and the chisel grind as something that was easy and quick to sharpen in the field. Often I had nothing more than the sharpening rod on my bayonet sheath. The Mini CQC-15 is a fat bottom girl, and I love it. The handle is wide and fills my paws well. The knife has a palm swell, and a decent jimping for the thumb. The handle fills my hand very nicely, and I have no complaints about its design or shape. The grip design reminds me of a more subtle version of the ancient Greek kopis handle. It’s designed to aid in retention when cutting or stabbing. The G-10 grips panels are aggressively textured, and some people might find it uncomfortable. You should bear in mind that by order gloves are part of the personal protective equipment of the uniformed services. Gloves can challenge grip, so this aggressive texturing is a must have for a knife like this. The Mini CQC-15 has a titanium liner lock that’s strong, but the knife seems to lock-up at different points. This is especially true if you use the wave method of opening these knives. Sometimes it goes extremely far and other times barely at all. However, I have never had the lock fail me in any way. I will admit I find myself subconsciously checking to make sure the blade is locked before getting the work. Deployment can be done through a top thumb disk that’s ambidextrous, well textured and feels strong. It’s a slow deployment method, but a functional one. If you want to go a little faster, you have the wave method. The wave is based on that little hook on the thumb rest that is supposed to catch on your pants and open the knife as you draw it. It’s a neat feature, but it doesn’t always work. It seems to work better in some pants than others. Pulling the knife like that is not dependable enough to trust in a self-defense scenario. I will say it works way better in jeans than in the typical material uniform pants is made of, which is odd seeing as who these knives are designed for. I may also be bad at opening a knife this way. The utility is there, but I can’t seem to master the wave. The lens you view this knife through is likely going to significantly affect your opinion on it. It’s not a graceful tool, and for the cost, you can get a knife that cuts smoother, features an ambidextrous pocket clip, and a more natural method of deploying the blade. The Mini CQC-15, as well as the rest of the CQC series, is designed for folks in uniform. They have a broad set of features that make them an excellent knife for those in uniform. I still love it, and my CQC-7BW, but I am aware of my own bias and nostalgia. That being said its an objectively good knife, and one I would suggest if strength and simplicity are your main desire. 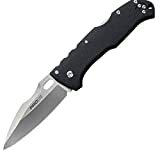 If you are thinking of buying an Emerson Mini CQC-15, please consider purchasing it at Amazon or BladeHQ. By purchasing things through any of the links on this website you support BladeReviews.com, which helps produce future reviews. Thank you very much.